Maybe you spied her work in a Carson’s store this past holiday season, or you’ve admired her signature “sgraffito” technique in one of the local art galleries that can’t keep up with demand for her colorful works of clay. Step inside the studio of West Dundee’s rising star. Just a few years after taking her first ceramics class, West Dundee resident Danuta Loane is enjoying a runaway success as a potter. Her work vanishes quickly from the shelves of gift shops, boutiques, galleries and shows in places like St. Charles, Spring Grove, Barrington and West Dundee. She takes orders from art lovers around the country, most of whom have found her original pottery on her online shop at Etsy.com. This past Christmas season, her works appeared at three Chicago-area Carson’s department stores. Not too bad, considering Loane only started throwing pottery in 2011, after a friend invited her to a class at Fine Line Creative Arts Center, in St. Charles. She quickly got hooked. Loane now spends four to eight hours a day in her West Dundee studio, in between driving her 15-year-old daughter, Emma, to school and working part-time for her father’s custom woodworking business. The 50-year-old painter-turned-potter finds herself especially drawn to Japanese gardens, culture and patterns, which weave their way into designs including ginkgo leaves, blackbirds, leaves and Koi fish – sometimes set against diagonal cross-hatches. “All my inspiration really comes from nature,” she says. Sometimes, a look outside the studio windows is enough to connect her with the wooded lot and wildlife just outside. Her favorite colors – blues and greens – remind her of the sky. Many of Loane’s pottery pieces have some element of “sgrafitto,” a process that involves etching away a layer of hardened clay to create a complex pattern. Here, she refines the outer shape of the pot before setting a black glaze and etching her design. Clay is unforgiving and unpredictable to the unskilled hand. Taking lumps of stiff, sticky earth and forming them into symmetrical works of art is an impossible feat for some. It comes with a degree of ease for Loane. That’s not to say she hasn’t had her share of mistakes along the way. Works have exploded, glazes have turned weird colors, and things have cracked under the pressure of being fired at more than 2,000 degrees. The failures of her first firing are emblazoned in her memory. 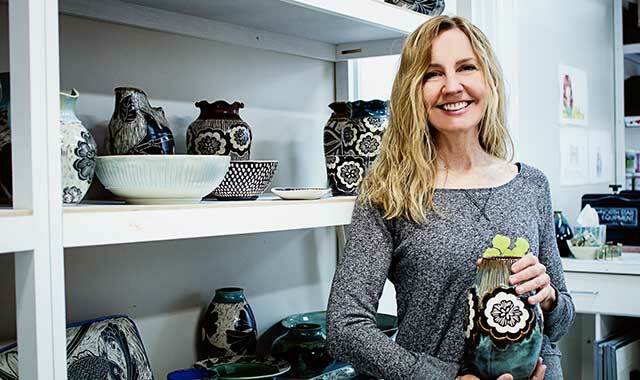 Loane buys 600 to 800 pounds of clay at a time, transforming it into bowls, vases, mugs, trays and spoon rests she’ll sell to art buyers or art gallery owners, like Joyce Younger, owner of Colored Squid Gift Gallery, in Barrington. Occasionally, Loane gets special requests, like a French confit bowl reproduction. Someone recently requested custom luminaries that could adorn every table at a new restaurant. They were needed within 21 days; Loane usually requires four to six weeks. She made the order in time. “They had to dry outside in the sun,” she recalls, adding that she noticed dragonflies landing on the pieces. 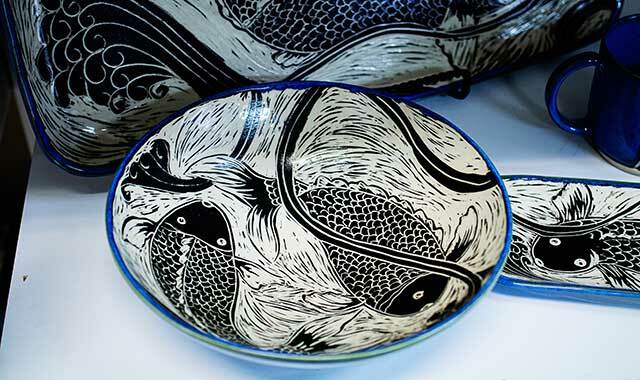 Fittingly, each piece of her pottery carries a dragonfly symbol on the bottom – her signature, of sorts. Loane grew up in Schaumburg and graduated from Conant High School, in Hoffman Estates. She earned an associate degree from Harper College and then studied fine art at Columbia College in Chicago. Before she graduated, Loane received an offer to join the Florence Art Conservation, an Italian organization with work in Chicago, where she would go on to restore priceless works of art for landmark hotels during the 1990s. The experience has left an impression on Loane’s pottery. Instead of removing layers of dirt and smoke, she now removes layers of clay using a “sgraffito technique.” This method of decoration involves the scratching away of hardened clay and the application of colored glazes to create ornate designs. “Now, instead of removing dirt, I’m removing parts of the clay to reveal some beautiful image,” says Loane. Sgraffito is a long process and one that requires patience. No matter how busy she gets, Loane remains committed to each piece, constantly drumming up new ideas and reinventing herself along the way. Her process is, in many ways, the opposite of an assembly-line process. Though she’s only been throwing clay for seven years, Loane feels she’s somehow always had her hands and mind wrapped around this art form. So, it felt less like an abrupt change in her career, and more like a natural transition. “I have always been an artist and finally found something that I am truly passionate about, and it feels like home,” she says. Fear and lack of confidence, she admits, may have stopped her from switching gears in the past, but now she looks at a life that’s filled not with challenges, but with opportunities. “If I’m not awarded a commission or a retail vendor opportunity, I will still wake up, go to my studio, and make pots,” she says. Demonstrating the “sgrafitto” technique, Loane etches away hardened, black-colored clay into a dynamic, sweeping pattern. When the piece is done, it’ll receive an initial firing in Loane’s kiln before she applies colored glazes, fires it again and prepares it for sale. This past holiday season, Loane’s pottery was featured at Affair of the Arts, in Spring Grove, a juried show featuring original artwork by more than 40 artisans. She sold pieces at Swell Gallery, in downtown West Dundee, and at Fine Line. She regularly stocks Younger’s gallery, where her pieces seem to fly off the shelves. Loane landed her newest client, Carson’s, through the department store’s “Close to Home” program, which showcases items produced by hometown designers and artisans. Loane received word of her acceptance into the program while on vacation last summer. She successfully delivered more than 200 pieces, including lily and cherry blossom trays that continue to sell well in West Dundee, Schaumburg and Mount Prospect Carson’s stores. Accompanied by her cat Moose, Loane loses track of time in her studio. And even though she suffers the typical physical maladies that accompany a serious potter’s repetitive motions – arthritis in one of her knuckles, a sore elbow, a stiff upper muscle in her right arm from her wheel and clay roller – she believes it’s all worth it. As she fashions a blob of clay into a smooth, rectangular tray, she reflects on her many blessings and the reason she loves what she does. 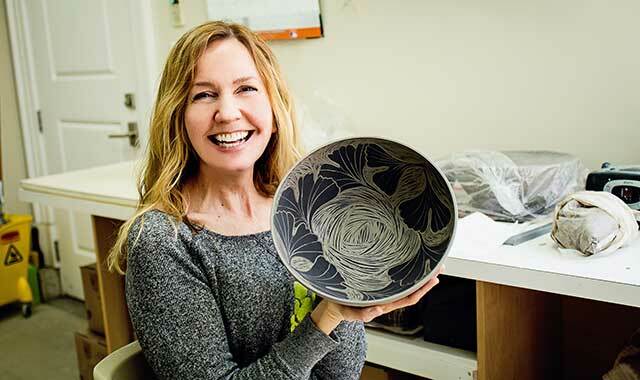 She’s already planning for upcoming shows, producing a line of vases for the spring Affair of the Arts show, and she hopes to land in the One of a Kind Show at Chicago’s Merchandise Mart in December. She’s also contemplating her own “Art Abandonment” project, which would involve the intentional hiding of a vase at a West Dundee park. The hope is that someone will find the work and take it home to enjoy. This entry was posted on Tuesday, May 1st, 2018 at 12:00 pm	and is filed under Features, Top Posts. You can follow any responses to this entry through the RSS 2.0 feed. Both comments and pings are currently closed.